Films on Demand – From the main screen, scroll down and click on Black History Month under the Featured this Month heading. Kanopy – The library strongly recommends that you setup a free Kanopy account first so that you can add & watch films from your Watchlist. For instructions, click here or ask a librarian for help. Social sciences teaching faculty may want to incorporate these films into their lesson plans and assignments. If you are accessing these video databases from off-campus, you will be prompted to login with your My Reynolds username & password. Help! I can’t get to a library database! Sometimes an off-campus student clicks on a library database and receives an error message. Don’t panic! This is a known issue with a simple workaround. Some students are not authenticated for the databases on our network, even though they are correctly and currently enrolled. BUT if a student logs in to the main Virginia Community College Portal one time, they will be recognized and will be able to login to MyReynolds as usual, and every time afterwards. While off campus, navigate to the main portal for Virginia’s Community Colleges. Then login with the MyReynolds username and password. Once this is complete, students should be recognized when clicking on the library databases…and be able to access them as usual. Hope this helps! If there are issues, please contact any of the campus libraries for help. Posted on May 31, 2018 Author SuzanneCategories General, Guides/Tools Online, Library DatabasesTags Databases, help, login, mobile, Off-Campus Access, student, technologyLeave a comment on Help! I can’t get to a library database! October is that perfect time of year to grab your bag of Halloween candy and popcorn, turn off the lights, and curl up in your favorite chair and blanket to watch some scary movies. Reynolds Libraries has got you covered. Our Kanopy database collection of streaming movies offers access to a wide variety of horror films including cult classics, indie horror, and spooky movies from around the world. Your Reynolds login is your movie ticket for accessing these films from off-campus. Pick your poison and let the film fright fest begin! We are happy to introduce Kanopy video streaming to the Reynolds community! Kanopy provides access to one of the most unique collections of films in the world – including award-winning documentaries, training films and theatrical releases – on every topic imaginable. They also have a significant number of art-house and indie films. Total, there are over 26,000 films available. Kanopy has a user friendly interface that makes browsing and searching for films a breeze — plus Kanopy is compatible with all major browsers. Like most of our digital databases, Kanopy is available for access both on and off-campus. Just remember that for off campus access, you will be prompted for your VCCS/MyReynolds login credentials. But once you’re in, you can stream any video you wish! Click here to access Kanopy (it will also be listed as a resource in our A to Z database list). Posted on January 12, 2017 January 12, 2017 Author wweaverreynoldsCategories Library Databases, MultimediaTags film, streaming videos, technologyLeave a comment on Introducing Kanopy video streaming! Lunch and Learn Library Style: Library Top Ten For Faculty! Our first Lunch and Learn Library Style was such a success that we decided to have another one! 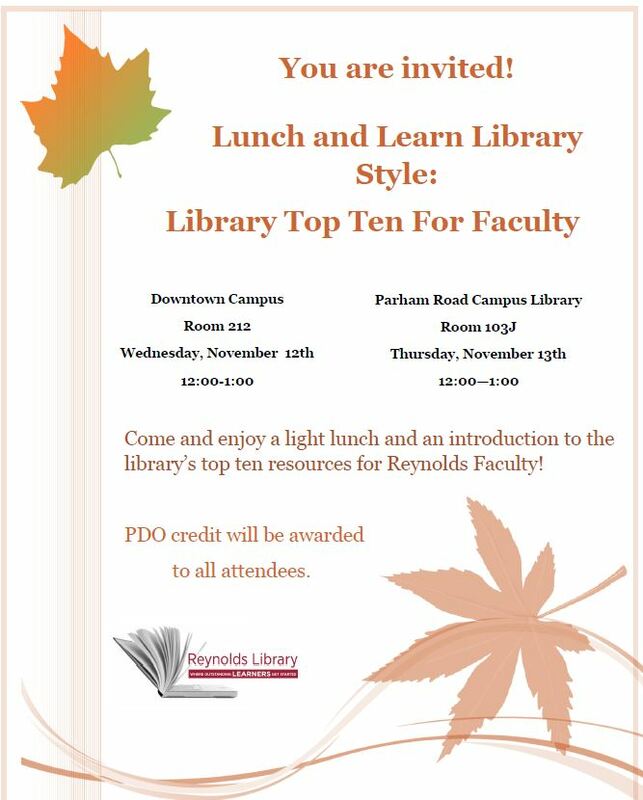 Come and join the Reynolds Library Staff for lunch while you learn about our top ten resources for faculty. This session is open to all Reynolds faculty and PDO credit will be awarded to all attendees! Posted on October 29, 2014 October 29, 2014 Author loftanthelibrarianCategories Information Literacy, Library Databases, UncategorizedTags Lunch and LearnLeave a comment on Lunch and Learn Library Style: Library Top Ten For Faculty!